I’ve got Pep in my step! I’m down with some Pep. No, not that kind of pep..though I do love a peppy, careful, happy attitude. I am talking about the kind of pep that is colorful and delicious. My little lovers: green, yellow, and red peppers. It occurred to me over the weekend that I haven’t shared any recipes lately. Don’t worry…I haven’t stopped cooking or baking, I still do plenty of that. It is amazing to me how much my cooking has changed over the course of the last year. I used to cook crazy, fatty Italian dishes and found a reason to incorporate bacon into pretty much anything. In fact, one of my favorite snacks was chocolate covered bacon (Mmmmm…so good). Now my cooking focuses on healthy recipes that are just as good (unless Im cooking for Kyle….he gets his own special meals since his diet is a little different than mine). 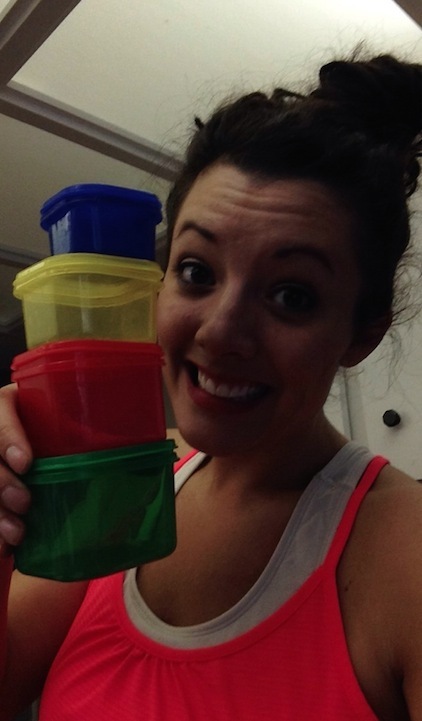 My current 21 Day Fix meal plan focuses on portion control and is amazing. Initially I was worried I would be eating bland, gross items that would bore me and cause me to jump off of the health wagon and back on the fatty express. Fortunately, this isn’t the case. I have loved loved LOVED exploring different recipes and still being satisfied with my appetite. SCORE! Just so those of you reading don’t get confused by any lingo or jargon I drop in this blog, let me explain what the Fix is all about. It is focused entirely on eating the right portions for your body. Based on your weight and what you want to achieve, you determine how many portions of specific food groups you eat and then use the color coordinated containers for each food group. So when I say “red”, I am referring to protein…..”green” vegetables, and so on. It really has helped me maintain a more consistent eating plan, as well as give me a whole new way of looking at my food. Every time I go to eat, I equate that dish to the corresponding color containers. Back to the pep. 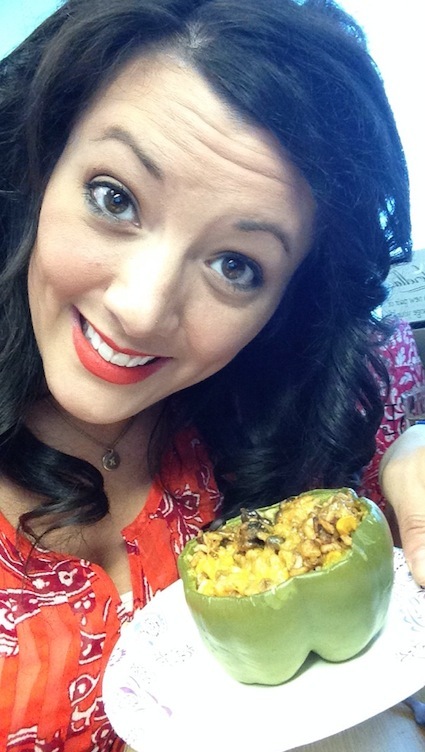 I really love stuffed peppers and was on a mission to find a recipe that would work for me while also being delicious. I found a variety of recipes online and finally did what I always seem to do: take a couple of recipes and mix them together so the end result would be a surprise. I like trial and error with recipes and figured I couldn’t mess this one up. The end result: fabulousness. Your taste buds (and waistline) will thank me. Ahhhh I love that these little containers double as measuring cups! 2. Cut the tops off of your peppers and hollow them out. 3. Prepare rice or quinoa. I have made these using both ingredients, just cutting the portions in half so it is still equivalent to the 1/3 cup serving size. 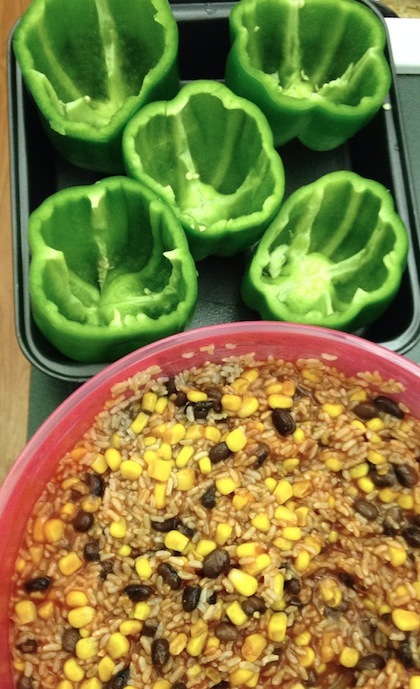 I will say….I prefer brown rice over quinoa in this recipe. 4. While that is happening, I brown my meat. 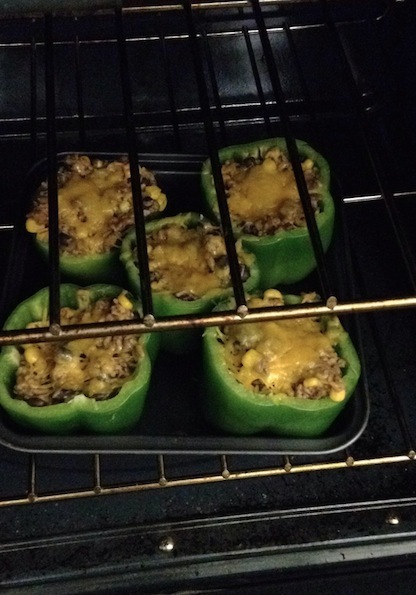 Fixers, you can use the 21 day Southwest Seasoning recipe. I don’t use seasoning though…Im not really into it. 5. Drain and rinse your black beans while microwaving your corn (if you are using frozen). 6. In a large bowl, combine beans, corn, browned meat, and the rice/quinoa. After stirring that all up, add tomato sauce. 7. 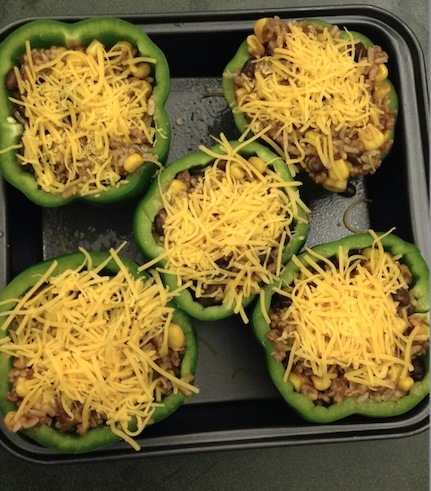 Stuff peppers with mixture and sprinkle cheese on top. Remember, 1 blue container of cheese! Don’t get cheese heavy! 8. Bake for 40-45 minutes. Make sure the cheese is melted! This recipe yields 2 peppers, but keep in mind that these are easy to prepare, so just adjust the portions accordingly if you place to make more. Have extra filling? I did and used it throughout the week in wraps or on my salad or a little healthy Mexican lunch! Enjoy!